Pleuntje Cornelia “Cora” Scholten was born June 12, 1918, in Hoogbloken, the Netherlands, to Adrianus and Maaike (Van Kekem) Baas. 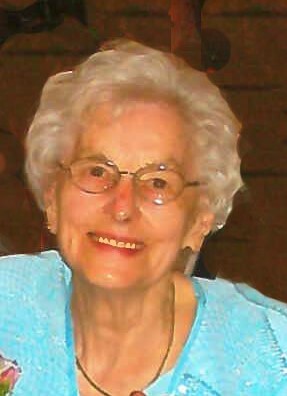 She passed away surrounded by her family on Friday, April 5, 2019, at the Hospice of Pella Comfort House. Her family moved to Arkel and owned a butcher shop. At age 21, Cora moved to Overschie where she worked several jobs to support herself and found security in attending church. It was at church where she met Willem in 1942. They were married February 1, 1943. With WW2 upon them they faced several challenges, but through faith they found their way through the war. Yvonne, Arie and Willie were born in Holland and with their three children, they decided to make a life in America in 1951. They first lived in Pella where Shirley was born and moved to Sully in 1958 where Mark was born. Cora was a devoted wife and a loving mother, working hard raising their children and keeping a spotless house. She enjoyed gardening, knitting, playing games and visiting with everyone. She was filled with great joy when her children, grandchildren and great-grandchildren came for Sunday morning coffee after church. They were faithful members of the Sully Christian Reformed Church where Cora enjoyed the fellowship and work on sewing days. Cora’s life has been long, and although there were struggles and hard times, joy and happiness prevailed through faith. She will be dearly missed by all her family and friends. Cora was preceded in death by her husband Willem “Bill” Scholten her son William “Willie” Scholten, her parents, and ten siblings.